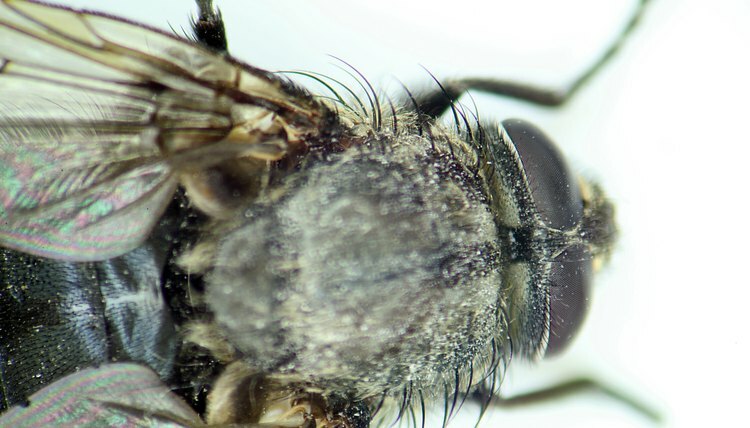 House flies may not seem like a pest that can cause much harm to humans, but they are able to carry disease agents, especially in areas of poor sanitation. Since flies feed on waste matter, garbage and human foods, they are able to cause problems including food poisoning, diarrhea, cholera, dysentery and eye infections. Proper preventive measures can keep house flies from ever being a problem. Check the screen in a window to make sure it fits properly and does not have any holes in it. A poor fitting screen will allow flies to fly right into your home. A proper fitting screen can be purchased at a hardware store or almost any place that sells windows. Install new screens to prevent flies from entering a home. Fix any holes in the window or windowsill that allow flies inside. Check for cracks, holes, crevices and anything that can act as an entrance point. Fill any entrance points you find with caulk to seal the hole. To do this, simply buy a caulk gun and a tube of caulk from any hardware store or big box store. Point the gun into the entrance points and squeeze the handle to release caulk into the holes. Repeat until all entrance points have been sealed. Remove any garbage located outside near the window and inside that would draw flies to a room. Organic waste outdoors including animal feces, rotting fruit and other garbage will draw flies to an area. Keeping those things away will prevent flies from accessing a home. Keeping a room free of uneaten food and other trash will keep flies from being attracted to an area. Also keep garbage cans and dumpsters as far away from windows and homes as possible. Place a sticky trap near a window to capture any stray flies that do get into a home. Hang the sticky trap in a window sill or near the window. Flies will get stuck on the trap, and the dead flies and trap can be replaced as needed. Why Do Flies Circle You?